I gave a presentation this week at Hack in the Box in Amsterdam about hacking wireless presenters (slides here. My demo showed how I could abuse vulnerabilities in the product to get a Metasploit payload on to the PC of someone using a wireless presenter, by just sending keystrokes to it. This article describes how I did it and why you may be at risk if you use any wireless input device (such as a wireless mouse). At lot of security research has been done on wireless keyboards in the last couple of years. 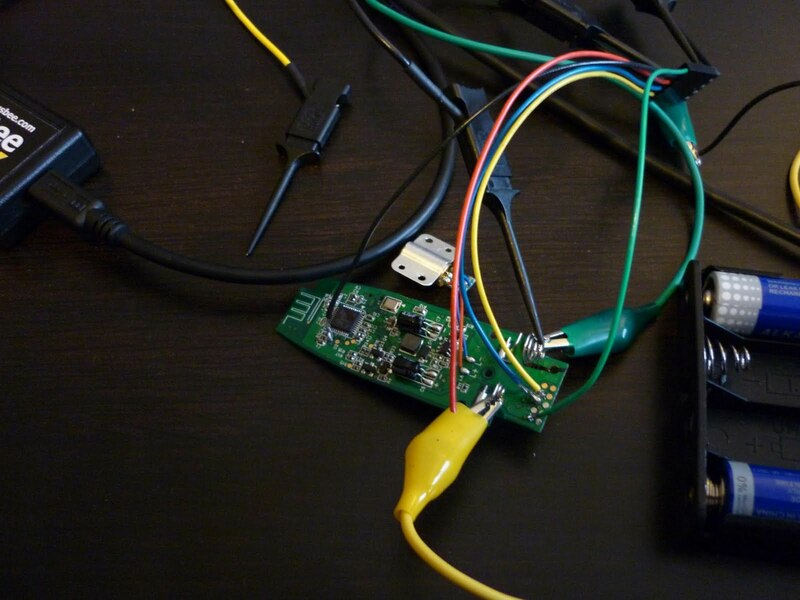 27Mhz keyboards were attacked successfully and can be sniffed using a home-built device. The same researchers took on modern 2.4Ghz devices as well at the end of last year. At the beginning of this year, I started to look at the security of wireless presenters. 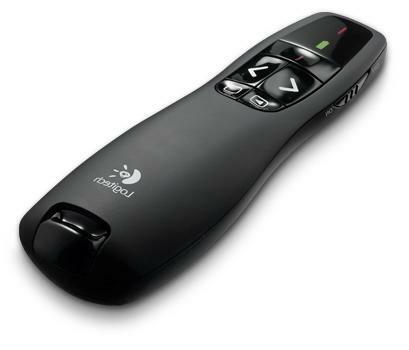 The one I had, a Logitech R-R0001, is a 2.4Ghz presenter. I used it while giving my talk at HAR2009 last summer, so I was curious about the risks involved with its use. When you plug the accompanying USB dongle into your laptop, a new keyboard is detected, you can then use the presenter to control your Powerpoint presentation. So basically a wireless presenter is just a wireless keyboard with only a couple of buttons. For example: If you press the 'next slide' button, the computer the dongle simulates a page-down keystroke and Powerpoint displays the next slide. On of the things that worried me was: could someone in the audience send a 'next slide' command to the dongle in order to go to the next slide before I wanted to do so? Or worse: could he send random keystrokes to my laptop (after all, the device is a keyboard!). Wouldn't it be fun if you could make a random message appear on Steve Jobs' (or Steve Ballmer's) screen when he's giving his latest keynote? Needless to say doing so may be a criminal offence in your country. In short: yes you can. Someone in the audience can control the slides and can send any keystroke you want to the victim, as if they were sitting at the keyboard. You can build a device to do this using an Arduino and a wireless module for about €30. I started my research by simply opening up the presenter device. When looking at the IC's ('chips') on the circuit board I quickly noticed a CYRF6936 IC. The 'RF' is quite a hint that this is a radio-related chip. When googling the number I came across the manufacturers site. This IC is made by Cypress Semiconductors and is common in 2.4Ghz systems. It operates on the 2.4Ghz band but the technology used is not Bluetooth or WiFi. Cypress invented their own proprietary wireless protocol ('WirelessUSB'). Sniffers for this kind of system are rather expensive or not freely available, so I decided to see if I could build my own. Not all presenters are based on this IC. You may also see (for example) the nRF24L01 in some devices (this is the IC the remote-exploit.org research was focussed on). Another popular one is the TI/Chipcon CC2500. For now, I decided to focus on Cypress-based devices. I also opened up the dongle, which contains (as expected) the same IC, along with a simple Cypress processor. Opening up the device is not always necessary, most devices list an FCC ID on the label which you can enter on the FCC site. You can find documents there detailing the FCC approval of the device for use in the United States, including internal photographs and in some cases schematics and block diagrams. The FCC ID for the R-R0001 is H4IPR24RF002, the manufacturer code belongs to Lite-on Technology Corp. 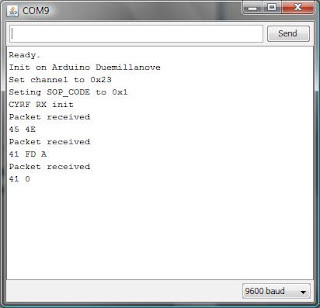 The processor communicates with the CYRF6936 and instructs it to send or receive packets. The command set for the CYRF6936 is actually quite simple: you can either read from or write to configuration registers. So to send a packet you set a couple of parameters (channel, mode etc.) and write the packet contents to some register. 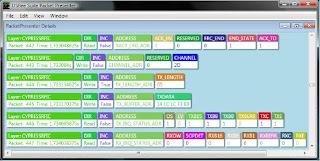 This communication uses a serial bus protocol called SPI (Serial Peripheral Interface). So I decided to try and intercept the traffic, by just buying a CYRF6936 IC, connecting it to an Arduino and set it to listen to packets. 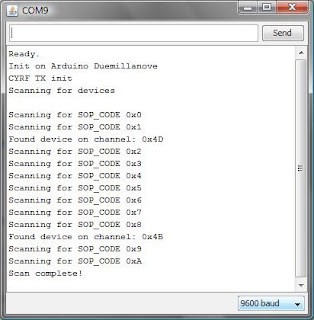 One of the problems I realized at an early stage was that the CYRF6936 has a lot of configurable parameters (channel, transmit mode, preamble, SOP-code etc.). This makes it quite hard to create a universal sniffer as it would constantly have to hop between a lot of possibilities. 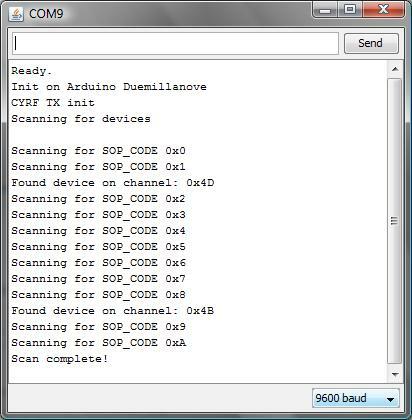 For example the SOP (Start Of Packet) code is an 8-byte setting. If the SOP-code of the sender and receiver don't match no packets will be received. Brute-forcing an 8-byte value over the air is impractical, and you would have to do it for all one-hundred channels, all four packet-modes etc. etc. etc. Hardware reverse engineering is the way to go here. I decided to try and sniff the SPI bus communication between the processor and CYRF6936 on the circuit board of the dongle. The leads on the CYRF6936 are quite tiny so they are hard to probe, but the processor is of a more convenient size and easy to put an IC clip on (which I already owned). The pin-out is freely available on the internet. You could also probe the processor on the presenter, but it is somewhat harder because the IC is smaller. The SPI bus uses four wires: MISO, MOSI, SCK and SS. The MISO and MOSI wires contain data (one wire for receiving, the other for sending), the other two do not contain data but are necessary for proper communication. Wikipedia has a good article on SPI if you want some more information. I hadn't done any SPI bus sniffing before but knew I would need a logic analyser to do so. I didn't own one but ordered a USBee SX from a web-shop in Germany for €100. 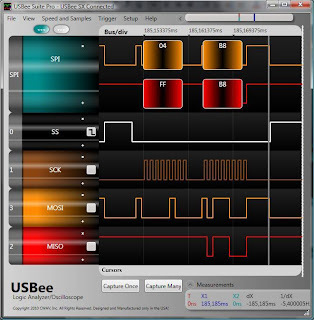 This is a USB-based logic analyser which uses the PC to interpret and display the data. 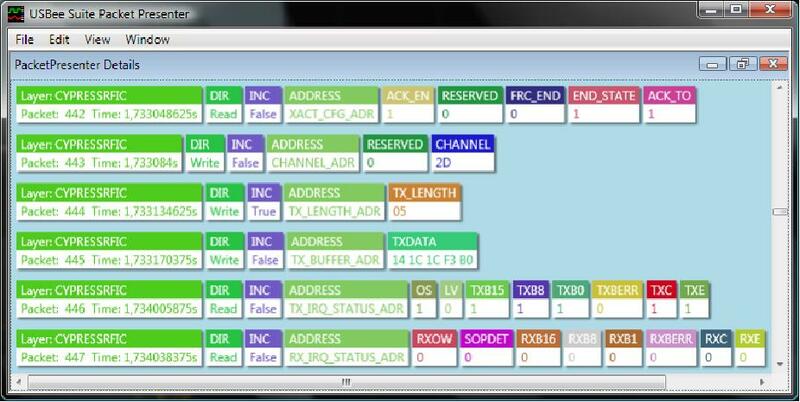 The software that comes with it has built-in support for decoding SPI. The software gives you a really nice low-level view of the communication (ones and zeroes or bytes) but if you buy a license for the 'pro' version, you can also look at decoded and interpreted data (register reads and writes in our case) with the Packet Presenter. Some alternatives are made by Zeroplus and Saleae. There is even an open source logic analyser available from Dangerous Prototypes. The USBee website has an example Packet Presenter file which can be used to decode CYRF6936 traffic. They only implemented a couple of the 44 registers, but with a lot of typing and datasheet reading, I completed the file with the capability to interpret all registers. The next step is actually sniffing the data, which is not that hard once you get the hang of it. Then you can use the Cypress datasheet and development guides to see what all of those registers. Some have obvious names, such as CHANNEL_ADR, others are more cryptic (FRAMING_CFG_ADR and MODE_OVERRIDE_ADR for example). By looking the intercepted traffic between the processor and the CYRF6936, I found out how the processor configures the IC (channel, SOP code etc.) and was able to create a compatible device using my Arduino. For the CYRF6936 I used a Unigen module (as recommended here) which can be bought at Digikey for €11.99. With this device I could listen in on the communication between the presenter and the dongle and quickly started to notice patterns. I then modified the code to enable the transmission of packets (which took a lot of debugging). I replayed the packets I observed going over the air and was able to send a 'next slide' command! By when I changed the first packet to 45 0E, the letter 'k' appeared on my screen; it was possible to send custom keystrokes! After a bit of googling I found out that 0E and 4E are standard USB scancodes for those two keys so it's easy to look up any key you want. The 41 00 packet is a key-up event. Some more googling I found out that you can use modifiers such as Shift, Alt and Control and also the 'Windows' key. I tried sending Win+R and a 'Run' box appeared on my screen. This means if you put this dongle in your PC, I can send it keystrokes and execute commands! Of course I cheated there, I intercepted how the processor prepares the CYRF6936. A different presenter will be configured in a different way (so they won't interfere with each other). 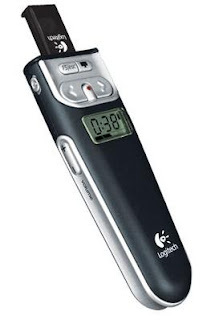 So I bought a different Logitech presenter, an R400, which was first introduced in August 2009. This radio in this one turns out to be a CYRF69103 (instead of a CYRF6936). The CYRF69103 is a 'Programmable Radio on Chip', meaning you don't need a separate processor (it's basically two IC's in one chip package). This posed a problem as I wanted to sniff the communication between the processor and the radio, but if these are both in one IC you cannot sniff the bus. The CYRF69103 is however compatible with the CYRF6936, although this is not very well documented. 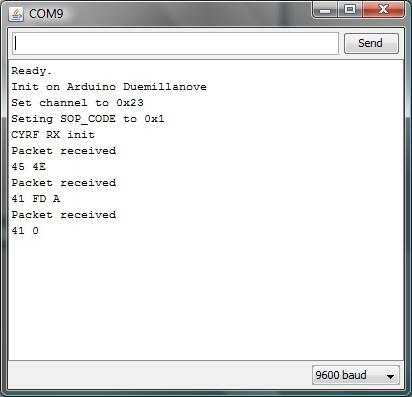 If you program the CYRF69103, you still communicate via SPI with the radio, everything just happens within the package. Lucky for us: for debugging purposed this SPI interface is also exposed to the outside (for debugging or connecting another SPI-based device). So I traced the pins on the CYRF69103 and found out these are connected to some test pads on the circuit board of the R400 presenter. So I soldered a couple of wires to the test pads to gain easy access to the SPI bus with the logic analyser. I found out this device is pretty similar to the R-R0001 presenter. The only thing configured differently were the channel and the SOP-code. The SOP-codes of my R-R0001 and R400 presenters are both mentioned in the datasheet as one of eleven examples. In some cases, Cypress seems to call these 'sub-channels'. The R400 presenter circuit board with some wires soldered to it so it can be connected to the logic analyser. The crocodile clips are connected to the two batteries as I had to remove the original battery compartment to gain easy access. So by simply cycling through the 98 channels and 11 SOP-codes (so 1078 combinations) I could send keystrokes to both the R-R0001 and R400, pretty easy. Another great thing about the Cypress based IC's is that they support auto-acknowledgements. When you enable this feature and send a packet, you can then simply check a register to see whether an acknowledgement packet was received. This is all handled by the chip so you don't have to write a lot of code to support it. As the presenters have this feature enabled I figured I could use it to actively scan for presenters (or at least their dongles) in range. By just sending a random single-byte packet (I just use a NULL-byte) on every channel and SOP-code combination I can detect presenters by checking whether any acknowledgements are received. The process of scanning all 1078 combinations takes less than 30 seconds. It could probably be optimised even further as the device probably doesn't use all 98 channels. After scanning for devices I can then decide to listen for packets or start injecting keystrokes. I don't own any CYRF6936-based keyboards, but the code would probably work with some of those as well. The second command mounts a WebDAV share (an Apache server with WebDAV enabled) using the Windows WebDAV Mini-Redirector service (a trick often used by the Metasploit framework as well). Then I just execute an executable that's on the share. The executable was generated with msfpayload. The payload connected back to my machine and spawned a VNC session, allowing me to control the machine remotely. I mentioned some other options in my talk. A cool one would be to just type the whole executable into debug.exe (a well known trick to create binary files from plaintext). An easy one would be to just add a user to the system or rickroll the audience (if you're into that kind of thing). Something I noticed is even though the presenters do not contain any mouse-functionality, my system did detect both a keyboard and a mouse when I put the dongle in my PC. This makes sense as the manufacturer only has to build one type of dongle for all input devices: mice, keyboards and mouse/keyboard combinations. This also means that when you're using a presenter, someone cannot only control your keyboard, but also your mouse movements. This is not such a big deal as an attacker can do pretty much everything with the keyboard and doesn't need a mouse. But of course this would also work the other way around: if you use a wireless mouse, the dongle that comes with it most likely also supports keyboards. So even though people may not be able to sniff your keystrokes, it will still be possible to send keystrokes to your PC (and execute arbitrary OS commands). If another keyboard appears in your Windows Device Manager when you plug in the dongle of your wireless mouse, you are probably at risk. The Unigen module I used has a range of about 30 feet. Other modules are available with a range of up to 1KM. Even though active scanning won't be possible at such a range, simply cycling through all the channels and sending the payload it should be possible to own multiple presenters at a large conference without even being in the audience. Another Logitech presenter is the R800. I didn't buy that one but the hardware seems to be almost identical to that of the R400, so my software will most likely work with it as well. How to fix all this? So what's the solution? If you already own a wireless presenter there is very little you can do (apart from accepting the risk and hoping nothing goes wrong). Manufacturers have started to use encryption for wireless keyboards and should start using this for presenters as well (Cypress actually offers encryption sample code). Not encryption mouse movements is probably acceptable, as long as the dongle only support encrypted keystrokes. I am not aware of any presenter that currently uses encryption. Another option would be to just not allow any other keys than the ones actually on the presenter. Of course this would still allow attackers to send the 'next slide' command, but remote code execution shouldn't be possible. Also, manufacturers would not be able to use one dongle for all their devices anymore. I'm not sure whether other presenters are vulnerable, but I think it's pretty likely. Where can I find it I need it! @Vittorio: Peter is right, mine is size SOIC8, also nice for sniffing EEPROMs. I bought it on eBay. @jisakujien: That's true :) Although I tend to think of it as part of a good protocol. how about another type of devices? @Black Ice: I'm glad you liked it! I'm not sure about other presenters but would love to see some more research in this area. This is some awesome work.. I recently got into the world of bus sniffing... I hooked up a sniffer to some suspicious pads on the inside of my cable modem... to my surprise.. i was reading some pretty nice debug console output. My next step will be to use the bus pirate to hook up to the console and try to see what else can be done. Any thoughts on using a bus pirate for hooking up to the radio as opposed to the arduino? Quite interesting. Curious to know how much time invested in this task! @Raj: I have a bus pirate but haven't tried to use it with the radio. I think it should work though. 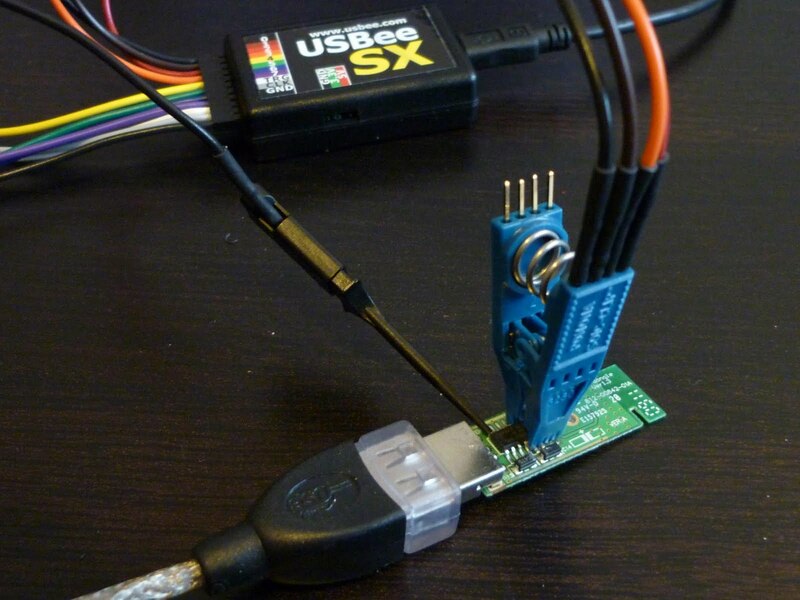 I tried to use it as an SPI sniffer, but this was not very well documented at the time and did not work for me, it's still a great tool though! I would be interested in reading about your experiments. you inverted the two pics: The side of the dongle with the CYRF6936 radio (actually this is the uproc we see here) and vice versa. Also on the other pic, "The R-R0001 dongle with the USBee SX logic analyser attached to the processor" => attached to the RF chip. @as: Glad you liked it! :) Actually, the square IC is the CYRF6936 (40LFXC package). I attached the logic analyzer to the processor as the pins are a bit bulkier and easier to probe. Where did you bought your USBee SX? could you provide me with the name of the webshop? The price has increased a bit since I bought it. The HITB website is down.. unable to retrieve the presentation foil. Mind to share out?